Rough Fort, near Limavady (C658230), is a massive earthen fort with a high central platform surrounded by a bank. There is a deep ditch and an outer bank which is encroached on slightly by roadways. The inner platform is about 30m diameter and 4m high. There is a good entrance causeway on the east side. The old church near Faughanvale Bridge (C580209) has two gables and some low walls remaining. There is a good round-headed window in the NE gable and a small pointed window in the opposite gable. The corners of the church are made from well formed sandstone blocks. In the churchyard there are a number of late-18th century stones. There are many plain gravestones as well as some simple stones with cross and initials. In the village of Greysteel (C559209) there is a crude schist cross. It is about 90cm high and 60cm across. The ruin of the old church in Eglinton (C529204) consists of one complete gable and some low grass-covered walls. The gable has a large pointed window with a sandstone frame. The gravestones are mostly 19th and 20th century with some plain stones. Near the church there is a large mid-18th century tomb. The chambered tomb near Tamnaherin Bridge (C518166) appears to be a single chamber incorporated into a field boundary. At least two large stones may be seen amid a lot of rubble. One of the stones is about 2m high. In a graveyard to the west of Slievebuck (C512139) there is a crude schist cross. It is about 2.2m high and one arm is missing. The present width is about 60cm. The standing stone noted about 2km SSE of this cross (C515130) is now lying down. It is a large slab about 2.5m long by 1.5m wide and 50cm thick. The chambered tomb (C517126) NW of Ervey Crossroads was investigated. A single chamber about 1m wide and 2.5m long may be easily seen. There may be a second chamber but it is greatly ruined and close inspection was not possible because of snow cover. The stones are up to 1m high and one of them is about 2m long. The Grianan of Aileach (C366198) is a large stone fort. The entrance is through a lintelled gateway and the internal diameter is about 20m. The walls are about 4m thick and have a number of terraces and stairways. Two mural passages run from the inside to the entrance. The passage to the right of the entrance is about 1.5m high and less than 1m wide. At its innermost end there is a very small opening communicating with the entrance. The other passage is lower and narrower. Near its inner end is a small recess in one wall. 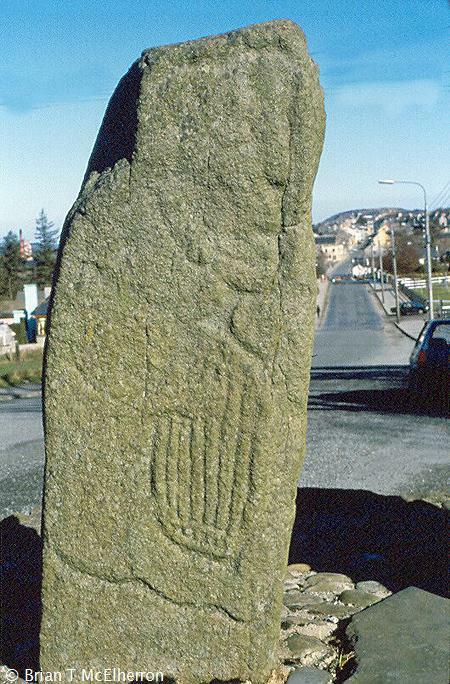 At Fahan (C345261) there is an elaborate cross-slab about 80cm wide by 2m high and 20cm thick. There are two projections at the cross-arms. On one face there is an interlaced cross flanked by two figures. There is another interlaced cross on the reverse. On one edge of the slab there is an inscription. Beside the slab there is the ruin of a small church with a three-light round-headed window. On the outside of the graveyard wall there is a stone with a ring-headed cross. O'Doherty's Keep, Buncrana (C342326), is a small rectangular tower of three storeys and a gabled roof. The present entrance, at first floor, leads to a mural stairway. At the bottom of the stairs is a murder-hole. The original entrance is now built up and a small window inserted. There is a small mural chamber opposite the bottom of the stairs. There are fireplaces at the first and second floor levels. There are no crenellations or machicolations. At Carndonagh (C466450) there is an early cross flanked by two carved stones. There is interlacing on bath sides of the cross. On the east face beneath the interlacing is a figure. On either side of his head is a simple figure and two more human figures flank the body. At the bottom of the cross are three human figures in profile. On the south edge are more human figures and interlacing. The stone to the south of the cross has a human figure on the west face and a human head on the north face. The stone to the north of the cross has human figures on the east and west faces, curvilinear designs on the south face and a fish on the north face. In the churchyard is the so-called "Marigold Stone".At the top of the east face is a crucifixion. Below it are two figures and below these is a cross. At the top of the west face is a marigold or seven-rayed star. The stem of this is flanked by two figures. Beneath these is a Maltese cross in sunken relief. Outside the door of the church is a greatly weathered lintel with a small cross in the middle. There are some carved figures to the left of the cross and some interlacing to the right. On the wall of the church is a sundial of 1835. 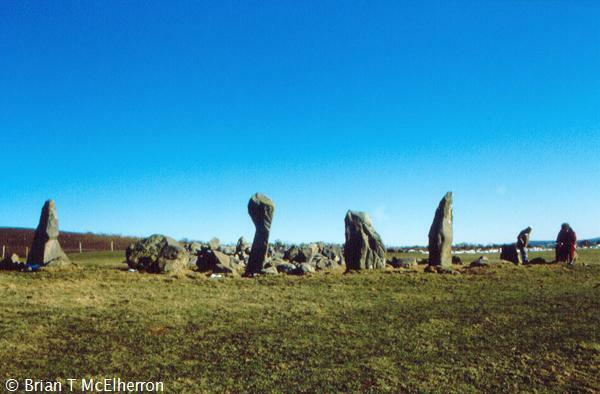 At Glackadrumman (C544475) are the remains of a stone circle. Only two arcs remain, consisting of seven stones. There is a great deal of field clearance and rubble present. The stones are up to 2m high. Laraghirril Court Tomb (C537470) was inspected. Two chambers may be seen but the court is missing. There may be a third smaller chamber at the east end. The total length is about 10m and the stones are up to 1.5m high. At Clonca (C526470) are the remains of a small church with a greatly weathered lintel. Inside the church is a fine gravestone decorated with a cross flanked on one side by foliage and on the other by a sword and a hurley-stick and ball. The base of the cross is expanded foliage. On either side of the cross head is an inscription indicating that the stone was made by Fergus MacAllan for Magnus MacOrristan. Beside the stone is another plainer stone and beside that is a small cross-inscribed stone. Just outside the churchyard is a tall cross with a partly restored head. It features figure carving and interlacing. A collection of monuments at Carrowmore (C516456) was investigated. To the west of the road is a rectangular enclosure within which is a tall plain cross over 3m high. The entrance to the enclosure is defined by two jamb-stones about 1.5m apart. The enclosure is divided by a grassy bank near the north end. Near this division is a flat boulder with a deep rectangular socket, possibly a cross-base, and a slab with two transverse grooves. Near the road is a slab with an inscription looking like a sword beside a circle. On the east side of the road is another plain cross about 3m high and near it is a boulder with a bullaun and a small cross. Greencastle (C653403) is greatly ruined and overgrown. 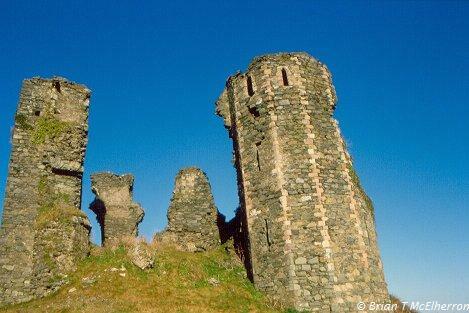 The remains of a twin- towered gatehouse may be seen at the west end. Throughout the ruins are traces of vaulted rooms and deep window recesses. There are at least two latrines. At the north- east corner are the remains of a D-shaped tower. In the middle of the north wall is a rectangular tower. Beside the castle are the extensive remains of a more modern fort. The Bishop's Palace, Raphoe (C259028) is a rectangular building with four square corner towers. There are brick-built crenellations and the remains of a machicolation over the doorway. There are two coats of arms on the outside of two of the corner towers. Inside there is a great deal of brickwork particularly at the fireplaces. The interior was not closely inspected due to the muddy nature of the ground. Inside Raphoe Cathedral (C258030) is a good reconstructed sedilia and a piscina. In the porch is a fragment of a lintel with carved figures. On the south wall of the tower is a carved mask and outside the south porch are some carved fragments. In the south wall is a small two-light window with ogee heads and a rectangular hood-mould with head ends. Part of it is modern. 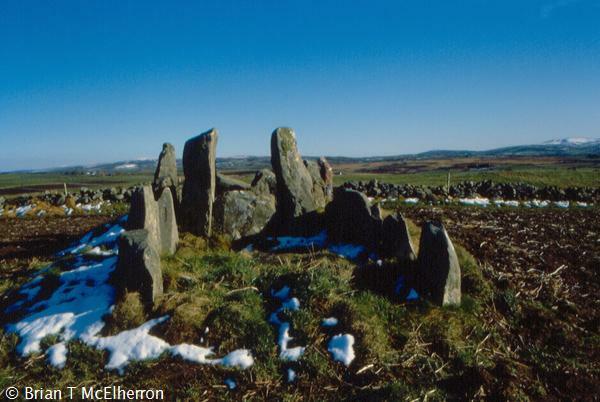 Beltany Stone Circle (C255005) is composed of over sixty stones set close together. The tallest stone is about 2m high and one stone is about 2m wide. Within the circle is a low cairn part of which may be field clearance. The estimated diameter of the circle is 40m. To the south-east is a single outlier about 2m high. At Kilmonaster Middle (H272975) is a small single-chambered tomb with a number of small orthostats and a displaced capstone. Nearby is a much larger structure (H273975). Near one edge of a tree-grown cairn is a cruciform passage-tomb. It is about 7m long and 1m wide and the total width at the cross is about 4m. There is one capstone in place in the north chamber and a displaced capstone beside the east end. There are two well-defined portal-stones at the west end. The cairn is about 20m diameter and some of the large quartz kerbstones are visible.